Macon Leary is a travel writer who hates both travel and anything out of the ordinary. He is grounded by loneliness and an unwillingness to compromise his creature comforts. Then he meets Muriel, a deliciously peculiar dog-obedience trainer who upends Macon's insular world and thrusts him headlong into a remarkable engagement with life. Bittersweet Evocative It's easy to forget this is the warm lull of fiction; you half-expect to run into her characters at the dry cleaners. Tyler is] a writer of great compassion. "The Boston Globe"
Tyler has given us an endlessly diverting book whose strength gathers gradually to become a genuinely thrilling one. "Los Angeles Times"
A delight A graceful comic novel about getting through life. 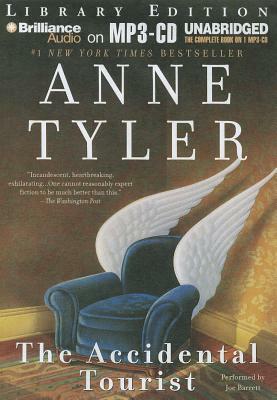 "The Wall Street Journal"
A rarely equaled richness and depth delicious humor Without Anne Tyler, American fiction would be an immeasurably bleaker place. "Newsday"